The red seats of the United Spirit Arena were covered by the national blue jackets of Future Farmers of America (FFA) members on Tuesday afternoon for the 2011 Lone Star FFA Degree ceremony. With 1,395 FFA members receiving the degree and golden charm, the ceremony seemed nearly as big as the Lone Star State itself. The highest degree awarded by the Texas FFA Association, the Lone Star FA Degree is bestowed upon FA members who have successfully completed the necessary work on their supervised agricultural experience (SAE) and FFA activities. FFA members may apply to receive the Lone Star Degree only after they have received the Chapter FFA Degree. In order to receive the Lone Star Degree, students must be active FFA members for at least three years, complete at least four semesters of agricultural science at or above the ninth grade level, maintain a SAE program and demonstrate their leadership skills, and show a commitment to the FFA through involvement at the chapter level and above. In addition, degree candidates must complete 25 hours of community service among many other qualifications. Rio Grande City FFA members Cody Lee Lara and Araceli Lopez were recipients of this prestigious award shown in the picture with their FFA Advisor Mrs. Randy Lee Martin. 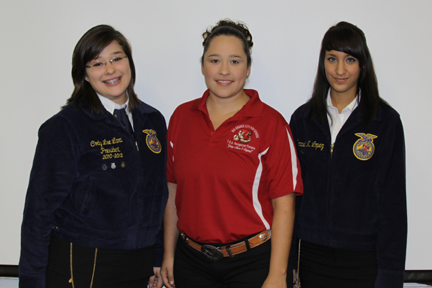 Pictured left to right are Cody Lee Lara, Mrs. Randy Lee Martin, and Araceli Lopez.